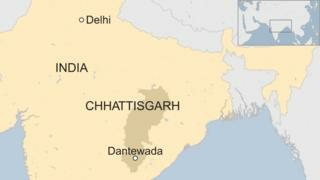 A legislator from India's governing Bharatiya Janata Party (BJP) has been killed in an attack on his campaign convoy in Chhattisgarh state, police have told the BBC. At least four security personnel were also killed in the ambush by suspected Maoist rebels. Bheema Mandavi, 40, was the state MP for Dantewada, which has seen Maoist violence for decades. The attack comes two days before voting begins in India's general election. The assailants set off an explosive device in Dantewada district before opening fire on survivors, police said. "It was a massive blast. The vehicle was blown apart," senior officer Girdhari Nayak told the AFP news agency. Prime Minister Narendra Modi, who belongs to the BJP party, tweeted his condolences, saying Mr Mandavi was "diligent and courageous" and calling his death "deeply anguishing". The mineral-rich state of Chhattisgarh has witnessed an armed conflict for more than three decades and attacks by Maoist rebels on security forces are common. The Maoists, who are active in several Indian states, say they are fighting for communist rule and greater rights for tribal people and the rural poor. In 2013, 25 politicians from the main opposition Congress party were killed in a similar ambush on an election convoy in Chhattisgarh. Dantewada has been particularly badly hit by Maoist violence. One of the deadliest ever attacks occurred in 2010, when 74 policemen were killed in the region. Chhattisgarh will go to the polls in three stages - on 11, 18 and 23 April.